New York, (September 26, 2018) — The Foreign Ministers of the Caribbean Community (CARICOM) engaged with Lord Ahmad, Minister responsible for Caribbean Affairs in the United Kingdom Foreign Office. 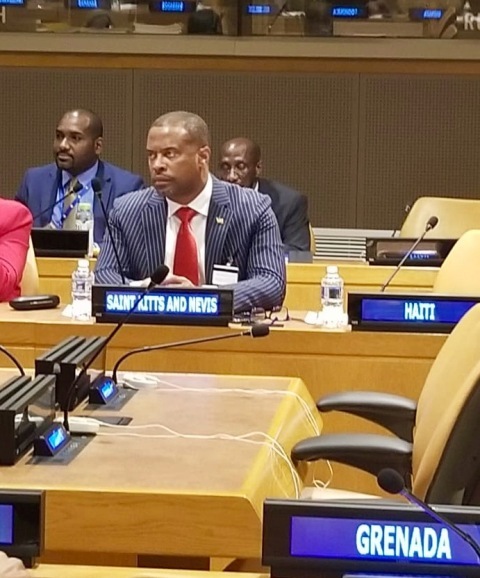 Foreign Minister Brantley, in his intervention, commended the UK for the recent relaxation of the criteria for granting development assistance in the aftermath of the spate of hurricanes in 2017. He also challenged the UK to advocate for concessionary development financing, thereby going beyond the limited criteria for access to development funds, particularly in the context of our economic vulnerability and highly indebted economies. Minister Brantley also inquired about Brexit and the possible post-Brexit trade implications. The minister thanked the UK Government for its continued investment in the human capital of the Caribbean through its Chevening Scholarship Programme. Other ministers highlighted the importance of issues relating to the Windrush phenomenon, climate change and the continued support of the UK government in disaster relief efforts in the region. Finally, the Ministers summoned the support of the UK in technical cooperation addressing the drug problem, human trafficking and harnessing the benefits of the blue economy.